Sam Weldon grew up in Champaign, Ill., a Midwestern college town. He was drafted and became a member of the 4th Marines Division at 18. Following a shortened training session, he and his fellow Marines were put on ships and sent to the Pacific. He was part of the second wave to land on Iwo Jima. His stories of the days and nights of battles there are amazing and touching and very human. He became a Corporal when the officers ranked above him were killed. Weldon talks about friendships made and friends lost and those who survived during the fights on Iwo Jima and afterward. His stories of being discharged and celebrating in Chicago add another picture. Looking back over it all, he can still say he would do it all again. Three hundred people attended a community conversation August 28, 2008 at the Alice Campbell Alumni Center at the University of Illinois IL featuring musical storytelling emphasizing the events of WWII and prominent songs of the period with vocalist and narrator Dena Vermette , Don Heitler and his jazz trio with Ben Taylor on bass and Jeff Magby on drums. The musical performance will be narrated by veteran John Weaver. The musical performance was followed by a video screening of people who lived and trained at the U of I during WWII and discussion with panelists plus an archival display. Speaking were Katie Harper Wright, who attended the U of I from 1940 to 1944 and was one of a small number of black students on campus; Jim Stallmeyer, who was drafted into the Navy and trained at the U of I from 1944-1946; Earl Swanson, who attended the U of I before joining the Army in 1943; William Prather, a soldier in the Army who trained on campus, and Kathryn Luther Henderson, a student from Champaign. The event was co-sponsored by co-sponsored by WILL, the U of I Alumni Association, and the U of I Archives' Student Life and Culture Archival Program, funded by the Stewart S. Howe Endowment. The panel and audience discussion were moderated by Tom Rogers of WILL AM-FM-TV. Joseph Smith enlisted in the United States Marine Corps on June 11, 1943. Smith selected the Marine Corps after a USMC recruiter convinced him that he would be treated just the same as white recruits and could expect a job other than cook. While Smith would eventually serve in the Okinawa Campaign as a truck driver, he quickly learned during his trip to boot camp that institutional racism was alive and well in the Armed Forces. John O’Connor of Champaign served in the U.S. Air Force during World War II. He was chosen as lead pilot with the first experimental flying unit aboard the B-24 Liberator. He flew 50 missions and also used his skills as a trumpeter and band director. Flying back from a mission, John and his crew would often pull out their instruments and play. O’Connor later became a member of the Medicare 7, 8 or 9 Jazz Band, performing around the country. 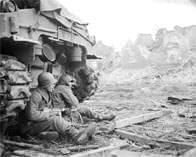 In World War II, soldiers from Decatur, Ill., served in North Africa, Italy, the Philippines and Germany. Local volunteers rolled bandages, collected food, and recycled bales of paper and heaps of scrap metal. Citizens planted victory gardens and bought war bonds and savings stamps. Dan Guillory's book, "Wartime Decatur: 1832 & 1945" documents the vigorous wartime culture based on community involvement and a strong sense of patriotism. Prairie Fire talks to Guillory about his stories of service both on and off the battlefield. Then producer Denise La Grassa recounts the experiences of Decatur's Carl Mocabee, who was a master sergeant in the Army stationed in the Philippines and New Guinea. He received a Purple Heart and Silver Star during his service. O.B. Streeper served with the Army Air Corps from March 1943 to September 1945. He was shot down May 27, 1944, over southern France. He parachuted to safety, and joined the French resistance. During one of the missions that he participated in, a bag was accidentally left behind contained his name and some of his identification. After finding this bag, the Nazis were apparently convinced that Streeper was one of the key figures in the French resistance so they offered a large reward for him—large enough that it represented several years of salary to an average French citizen—so Streeper had to distance himself from some of his colleagues in the resistance for fear that someone might turn him in for the reward money.